SEATTLE, Wash., April 24, 2018 – Tableau Software (NYSE: DATA), the leading analytics platform, today announced the introduction of Tableau Prep, a brand new data preparation product designed to empower people to quickly and confidently combine, shape, and clean their data, further reducing the time from data to insight. The application features a direct and visual experience for data preparation giving customers a deeper understanding of their data, smart features to automate complex tasks, and integration with the Tableau analytical workflow for faster speed to insight. Tableau Prep is included with the new Creator offering, part of Tableau’s new tailored subscription offerings. Existing customers of Tableau Desktop are also able to use Tableau Prep at no charge for the next two years. Tableau Prep is available now by visiting www.tableau.com/products/prep. Data preparation is one of the biggest challenges facing customers today. A recent Harvard Business Review article reports that people spend 80 percent of their time cleaning and shaping data, and only 20 percent of their time analyzing it. Customers cannot readily analyze much of their data because it is in the wrong shape or residing in disparate sources. But getting it in a useful form can be a complicated and time-consuming process, often requiring specialized skills. Tableau Prep has customized visual experiences to make common yet complex tasks – such as joins, unions, pivots and aggregations – simple. It is a drag and drop experience, no scripting required. As people use Tableau Prep, they see their data transform right before their eyes. These intuitive experiences help customers get desired results faster and with greater confidence. Tableau Prep also features smart algorithms to help automate common data prep challenges. As an example, Tableau Prep employs fuzzy clustering to turn repetitive tasks, like grouping by pronunciation or cleaning based on punctuation, into one-click operations. Tableau Prep integrates directly into the Tableau analytical workflow for faster speed to insight. Customers can open their flow in Tableau Desktop at any time, or easily share it with Tableau Server or Tableau Online. Tableau Prep also leverages Tableau Desktop data connectors, calculation language, as well as permissions and certifications, so customers can get up to speed quickly and collaborate at any point in the analytical process. In addition to Tableau Prep, today Tableau also introduced new subscription offerings that combine existing and new Tableau capabilities into packages appropriate for all people across an organization. 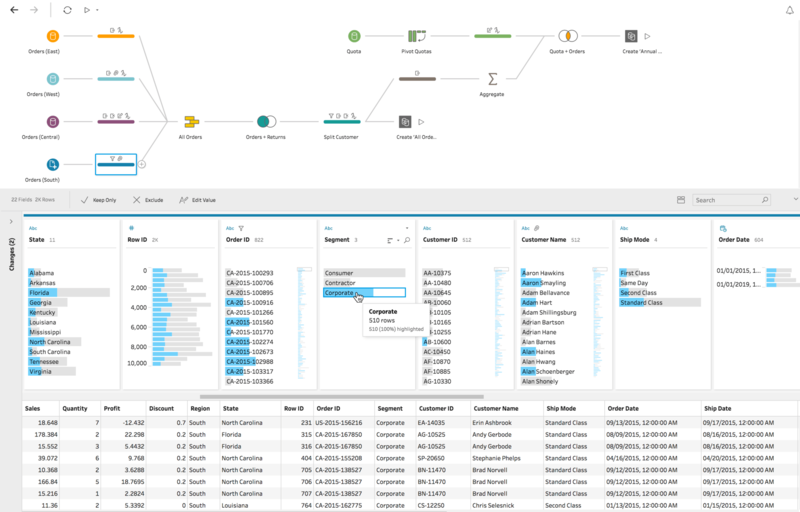 Tableau Creator, Explorer, and Viewer subscriptions provide tailored combinations of sophisticated analytics and drop-dead simplicity, allowing every customer to strike the appropriate balance and meet the unique needs of their own organization. Tableau Prep is included along with Tableau Desktop at no extra charge in the new Creator offering. Current Tableau Desktop customers are also able to use Tableau Prep at no charge until 2020. Updates to Tableau Server and Tableau Online are also available today, including a new authoring experience all in the browser – from data to dashboards with no desktop installations required. Customers with data in 20+ data sources including Microsoft SQL Server, Amazon Redshift and Snowflake or local data sources like Excel, can now have a complete browser-based analytical experience for all their users. This new end-to-end web authoring flow, which is also included in the Creator subscription offering, enables organizations to scale Tableau deployments faster through a centralized and governed authoring experience. Additionally, customers can stay in their flow throughout the lifecycle of analytics, speeding the journey from data to insights, by always being in the browser. Tableau Online customers can also take advantage of Dashboard Starters to get instant insight into their own data. Starters are pre-made dashboards optimized for common business applications like Salesforce, Marketo, Eloqua and ServiceNow. Customers can speed up their analysis, by editing or building on top of a Dashboard Starter. For more information on Tableau Prep and Tableau 2018.1, visit www.tableau.com/new-features.